Shopping is always fun, especially on Cyber Monday, when you can get so many attractive deals and discounts online. Both retailers and shoppers can get benefits on this special day. But, all good things have a bad side as well. And, the bad side is cyber scams and cyber criminal activities. So, both of you (retailers and shoppers) need to be more careful on this busiest online shopping day (Cyber Monday) to avoid becoming a victim of cyber criminal. Here are the 6 tips to raise your awareness and protect your identity on this biggest shopping day. 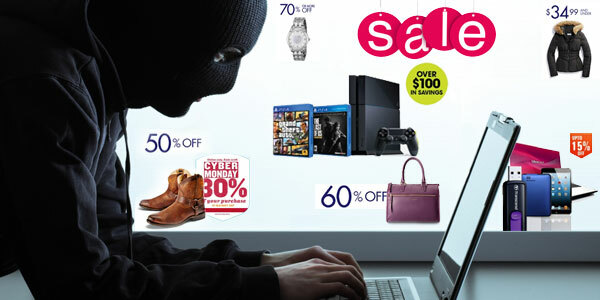 Don't forget to install antivirus and anti-spyware before cyber shopping. Thus, you can secure your computer too. Keep updating the antivirus software and install the most secured version in your computer. Moreover, install second opinion malware scanner in your computer before browsing shopping websites. Generally, in shopping season, people tend to browse many shopping related websites. So, this is the golden time for scammers. Finally, the choice is yours. The more you opt for secured options, the better you experience hassle free Cyber Monday shopping. Browse directly to the retailer's website instead of searching anonymously in search engine. Thus, you can avoid scammers who are waiting to steal your credit card information. These days so many "preview ads" are their online posted by the stores itself. And scammers are using this opportunity and they are very active in creating phishing and malicious websites to offer fake mails to the consumers on the occasion as Cyber Monday, Black Friday etc. They are offering tempting price to attract customers as well. Scammer can easily trapped you in social media sites. They can easily find out your information from your social media account. As example, scammers may post links of tempting Cyber Monday deals in facebook accounts. And you'll get this post as news feeds in your facebook account. Once you click the link or repost this, the scam will spread very fast. Many people will like your post and also repost it without checking it properly. There are chances to get coupons ads on any shopping related Facebook groups. So, check properly before you repost any news feeds. If your web browser provide warnings such as "Warning: Potential phishing threat", "Warning:Visiting this site may harm your computer", then close the site as early as possible in order to secure your personal data as well as your computer. You'll get lots of coupon mails from legitimate retailers. But, don't get excited about it. The emails are fake and their main motive is to steal your credit card information. Beware of cross site scripting attacks. Scammers may use this trick to make you sure that you're on the right retailer's website. And once you click on the link or pop up message, you're actually heading towards the "cross site scripting attack" and may lose your private information. So, be very careful while browsing for shopping. Try to directly visit the retailer's or store's website. When you're visiting via any link, there are chances to fall into scams. You're providing your information to the unknown shippers and they can easily misuse your information. Shipping scams are very popular before the holiday season. These days, big shippers are now alarming their consumers about this type of scams. According to Jason Pongratz, owner of PC Help Services in Carmel, "I would say probably 75 to 80 percent of what we see are virus infections or security concerns based upon phishing scams. It's not surprising for this time of the year. The shipping companies are well aware of it." As per him, the main problem is your mails. Once you click the mail, the scammer will get succesfully all your passwords and personal information. Moreover, he said the main medicine against this malpractice is our awareness and concern. You need to be more updated about the technology to fight back with scammers in order to secure your online purchase. Don't opt unreliable Internet connection. Make sure your Wifi connection is secured enough to do any online financial transaction. Don't turn on your wi-fi connection at public places such as coffee shop, railway station, library, etc. Do close the tab once you purchase the item and make sure the website is secured before putting your credit card details on the website. Checkout some more basic tips to fight with the cyber scammers. Try to use credit card instead of debit card. Because credit cards have more security protection option than debit cards. Do check the legitimacy of the charity websites. Check the privacy setting before online shopping. Install security apps. Don't click on unsolicited mails in your spam box. Be sure your mails are authentic. Try to avoid filling out the forms asking about your personal information. Try to log into the official websites of shops and retailers. If any pop up message is showing last minute chances or any "click right now otherwise you may lose the chance" then it is surely a scam mail. So, if you put your small effort to identify the scams and fake mails, you can easily get fun filled cyber shopping experience this Cyber Monday. So, take your time to install required software and keep yourself updated about all these malpractices. Have a happy shopping on this Cyber Monday!